While the Boboli Gardens are by far the most famous gardens in Florence (in fact, they inspired Versailles), I actually prefer the Bardini Gardens. 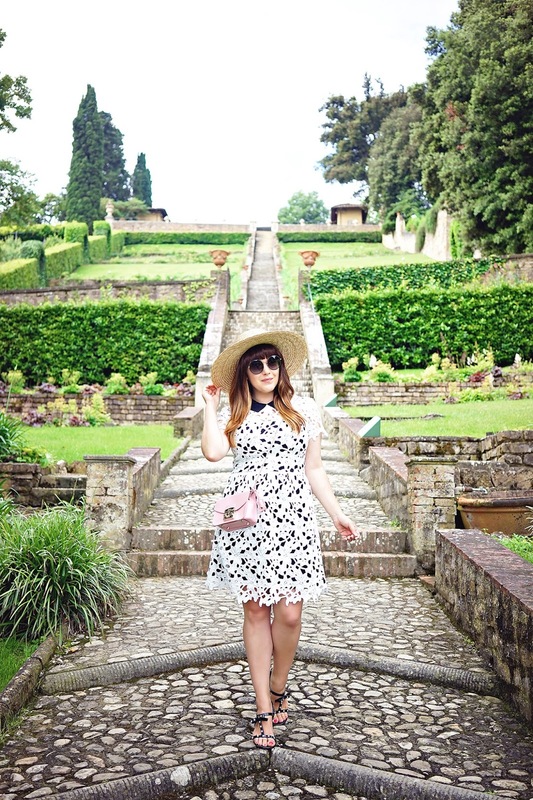 But the good news is when you purchase a ticket to the Bardini Gardens, it also gets you into the Boboli Gardens. So you can see both and decide which you prefer. And don't miss the newly reopened Belvedere Fort (where Kim and Kayne actually wed) in between the two. The first Sunday of every month is free state museum day in Florence. So I took the opportunity to spend a sleepy Sunday morning exploring the grounds of the Bardini and marveling in its amazing view of Florence. I wore this gorgeous black and lace dress for the occasion. 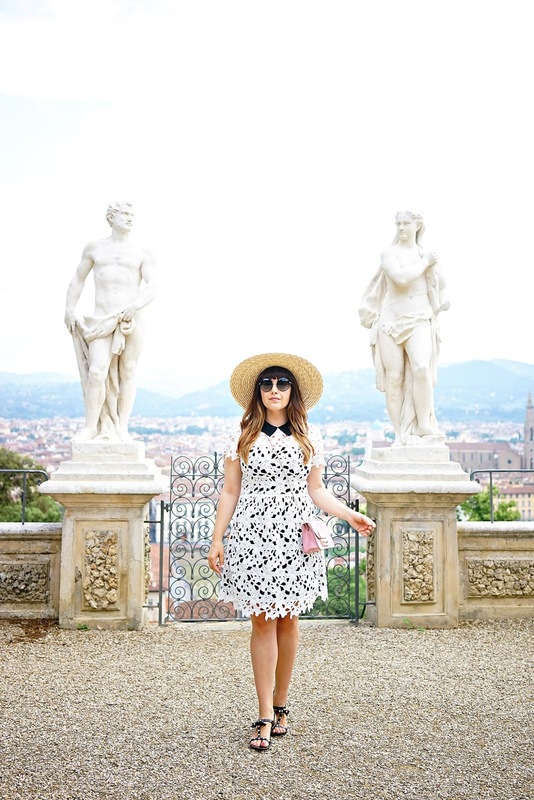 I love this dress because while it looks super chic, it is also comfortable and easy to wear. 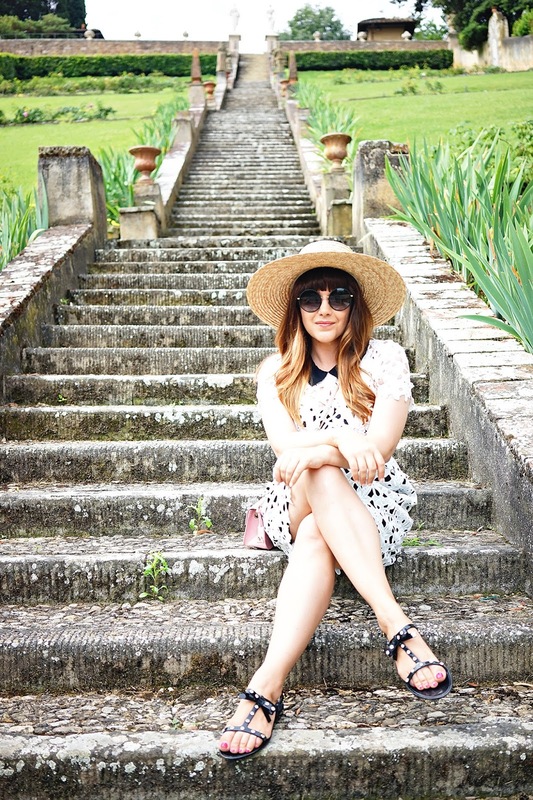 I decided to dress is down for the garden with my favorite straw hat, black jelly sandals (it has been so rainy in Florence, I have been living in these), and my new Dolce and Gabbana sunnies. These sunglasses are a bit out of my comfort zone, which is exactly why I like them. I tend to go for the same plastic/tortoiseshell silhouette when it comes to sunnies, so I was looking to mix my look up a bit. The round frames are just retro enough while still chic and modern. I especially love them with my faux bangs! Sadly, I don't think these frames have been (or will be) released in the states. I can't find any US based websites offering this style, but I did link an Italian site. I love buying unique designer sunglasses while in Italy. It is one of my favorite splurges while I am abroad.